This year we headed off to Derbyshire and on our way enjoyed a guided tour of Lichfield cathedral where we viewed the "Litchfield Angel", a limestone panel dated c800 AD, discovered during the installation of a retractable platform in 2003. It comprises three separate segments which are thought to have formed the corner of a shrine chest, possibly that of St Chad. On Saturday we spent a full day at Chatsworth, the seat of the Duke of Devonshire, the original Tudor mansion having been built in the 1560s by Bess of Hardwick. We had a guided tour of the house and also had plenty of time to enjoy the extensive gardens. There were mixed views about the modern sculptures which were spread around the grounds. Sunday saw us accompanied by an excellent Blue Badge guide who took us around the Matlock, Bakewell (some of us managed a Bakewell pudding with our coffee, not to be confused with the better known Bakewell tart) and Buxton area, taking in Monsal Head. Our guide then led us on a walking tour of the spa town of Buxton, pointing out such features as the Devonshire Dome, the largest unsupported dome in Europe and The Crescent, 1780-1786, by John Carr. After the tour some of us then sampled some Buxton pudding with custard while some of the less able took a tour on the Victorian tram ride. We ended the day in the sun at Carsington Water Nature Reserve where some of us visited the hides from which we watched a flock of lapwings. After our meal, Saturday evening was occupied by our annual quiz, won by a single point by "Clover" (Tom Cox, Trina Croser, Diana Hill & Sylvia Walker). We had three rounds of general knowledge and two speciality rounds. One included the outline of countries to be identified, made more difficult as they weren't to scale. The other comprised anagrams of ten well known people in the village which had a few heads scratching! On the way home we had either a walking or buggy tour of the National Memorial Arboretum, 150 acres of maturing woodland. We were interested to learn that it is not only a memorial to service personnel but to the police, fire service etc. Certainly a place for a revisit. Our final stop was at Baddesley Clinton (NT), a moated manor house which was owned by the Ferrers' family for over 400 years. Here we were shown the priest's hole which ended in the sewer! We then returned to Box after an extremely interesting and enjoyable weekend. Congratulations to the organisers, Buffy & Charles Freeman. 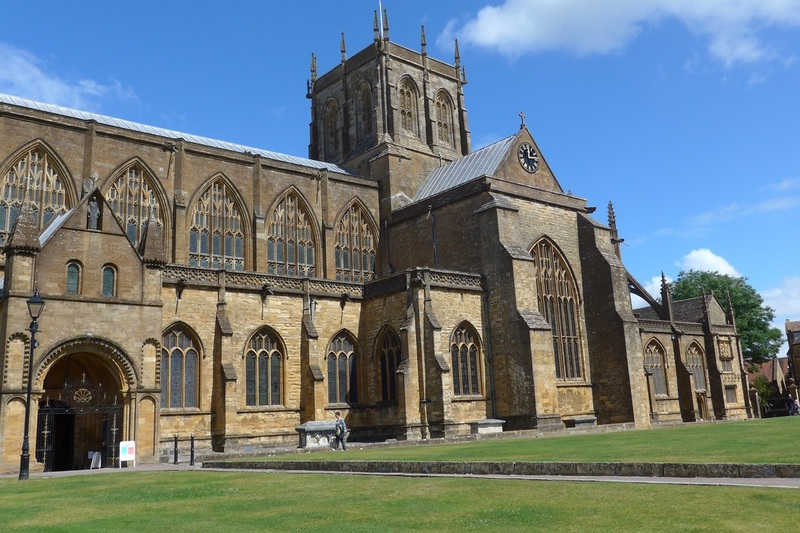 Our August outing found us in Sherborne where we visited the Abbey founded by St. Adhelm in 705 AD. Our guides explained that it was first a Saxon cathedral, then a Norman abbey and finally a parish church. During the 15th century the townspeople built what they hoped would become their parish church, attached to the west end of the abbey. The abbot was incensed and ordered the font to be destroyed. In retaliation, the townspeople fired a flaming arrow into the east end of the abbey causing fire to break out burning the scaffolding erected to repair the fan vaulting and the bells to fall to the ground. However, apart from some reddening of the stone the building work was accomplished resulting in some of the finest fan vaulting in England. Thanks to the Reformation the abbey was finally given to the townspeople as their parish church and the building attached to the west end was redundant and pulled down. After a stroll around the town we headed to the castle. This was built by Sir Walter Raleigh in 1594 as the original castle, (now a ruin) which was leased to him, was deemed not comfortable enough. 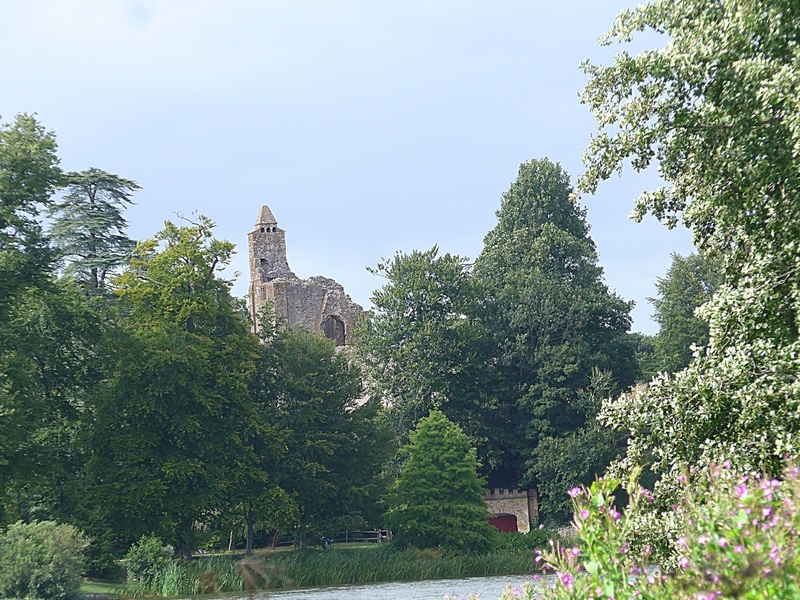 In the reign of King James I the castle was sold to Sir John Digby who added four wings. Over time the Digby family filled the castle with fine porcelain and many paintings. In the 19th century, the last Earl Digby died with no heirs. He was succeeded by his Wingfield nephew who added the Digby name to his own and the Wingfield Digby family still own the castle. How often have you travelled along the A420 through Wick? If so have you noticed a sign for the Golden Valley? Our July outing to this valley, which is now a nature reserve also has an industrial history of which none of us knew. Our guide, Molly, from the Friends of the Valley took us on a walk, explaining its history as an industrial site and transformation into a nature reserve. The first thing we noticed was that the soil was red. 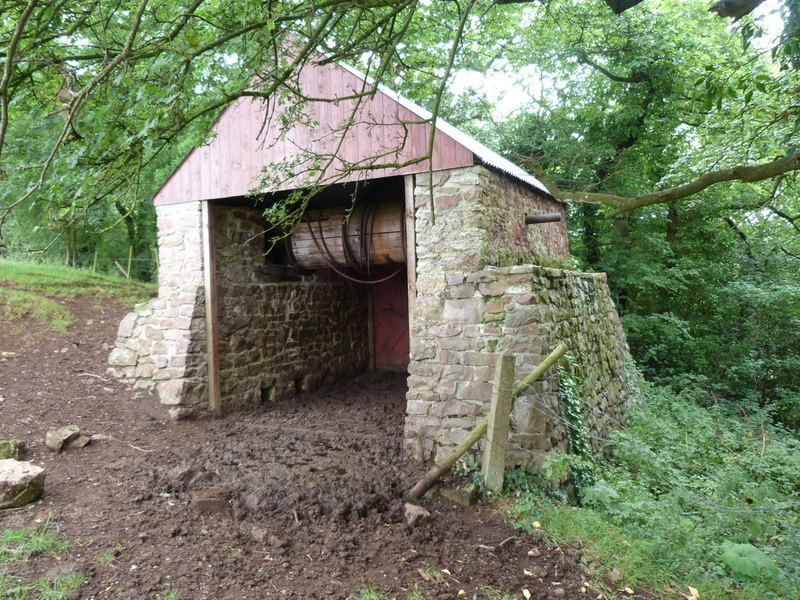 Molly explained that red ochre had been extracted from shallow trenches and mines at Rock Road and conveyed to the winding shed by ponies from where it was fed down to the works by gravity. There is a seating area where there are a number of buttons to press which give oral accounts of the lives of the workers who went home every day with their clothes stained red. Ochre can be used to make colours such as Venetian Turkey and Indian Reds, and also paints and varnishes. There is very little left of the works, which closed in the early nineteen seventies but the winding shed was restored in 2007 and is a grade II listed building for all to see. The works was powered by the fast flowing Boyd River along which dippers and king fishers may be seen and if you are lucky, as we were on a recce, a peregrine falcon. There is a designated bat trail as the valley is home to at least eight species of bat. After a two hour walk through the valley we retired to a local hostelry for an enjoyable lunch. 21 June was the Summer Solstice and Father’s Day. More importantly, it was the Vice President’s Outing led by John Chandler. Destinations are kept a secret until the day of the outing. This year, we travelled to two towns in Worcestershire – Droitwich and Pershore. Droitwich evolved because of its proximity to brine springs. From the Iron Age, salt was extracted from the brine and traded widely. Furnaces were built using timber from nearby woodland. By Domesday, the borough of Droitwich was England’s major salt-producing centre and many manors had rights to the salt works. Later income was earned by both the crown and local abbeys. Legend has it that when there was an interruption to the springs water supply, Richard de Wyche (born around 1197) tapped his staff on the ground and the springs re-appeared. Later he became Bishop of Chichester and was made a saint in 1262. We visited the Sacred Heart Church which was richly decorated in glass mosaics depicting St Richard’s life as well as that of the Virgin Mary.For centuries the River Salwarpe was used to transport salt but in 1771, a canal was built and used until the railway arrived in the 1850s. 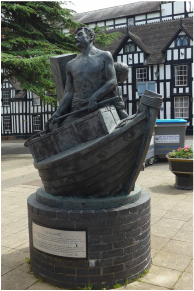 In the late 19th century, John Corbett invested in the salt industry and later developed Droitwich as a spa town. In fact, so much salt was mined that the High Street sank, leaving buildings at strange angles. Hot brine had been found to be beneficial in the treatment of cholera and the first Royal Brine Baths were built in 1836. 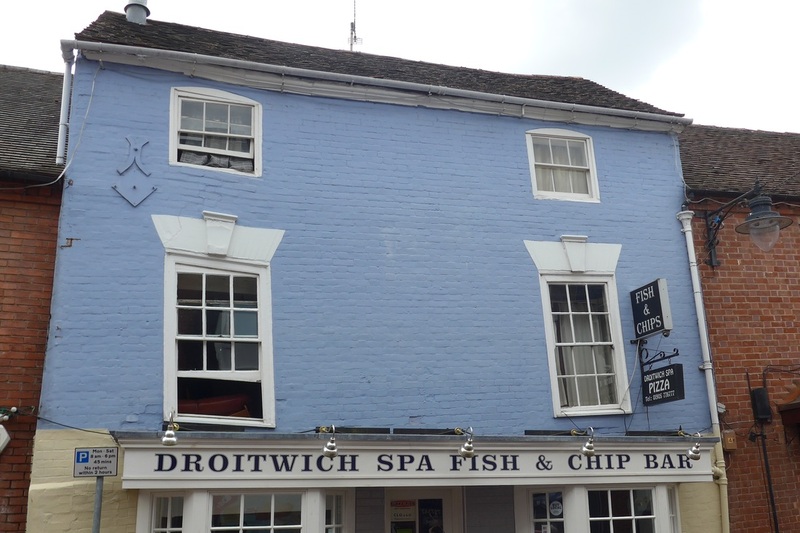 Droitwich was a famous Spa town up until the 1970s. Salt production discontinued in 1922. More recently, Droitwich has become famous for its radio masts, erected in 1934. From Droitwich, we followed one of the salt routes out to Pershore. Pershore had been a staging post between Worcester and London and is situated in the vale of Evesham, famous for soft fruit such as plums. Pershore Abbey was endowed with lands, some of which were later owned by Westminster Abbey. The abbey had been large but the west end was demolished following the Reformation. Pershore was a market town which declined from 1516 but coaching traffic revived it in Georgian times. It remains an attractive place to visit and was just the spot for a cup of tea and slice of cake before wending our way home. 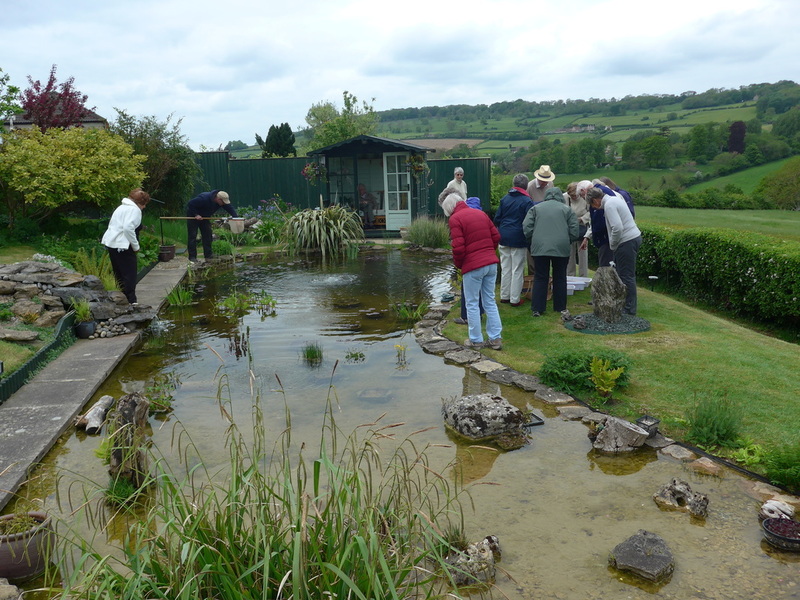 One of the real joys of our day outings is the variety, and we had a new experience in May when we visited the large pond dedicated to wildlife in Joy Keevill’s garden in Ashley, Box. As well as the expectation of seeing newts, the promise of a sumptuous tea was an attractive incentive to go. Both delivered in spades. Obviously the serious element was an intriguing talk by the acknowledged expert, Tim Kaye, of Wiltshire Wildlife Trust. Licensed to ‘pond-dip’, Tim netted and displayed dragonfly nymphs, baby water boatmen, damsel flies and nymphs, tadpoles, water snails, bloodworms, freshwater log lice, midge larvae and pond skaters. 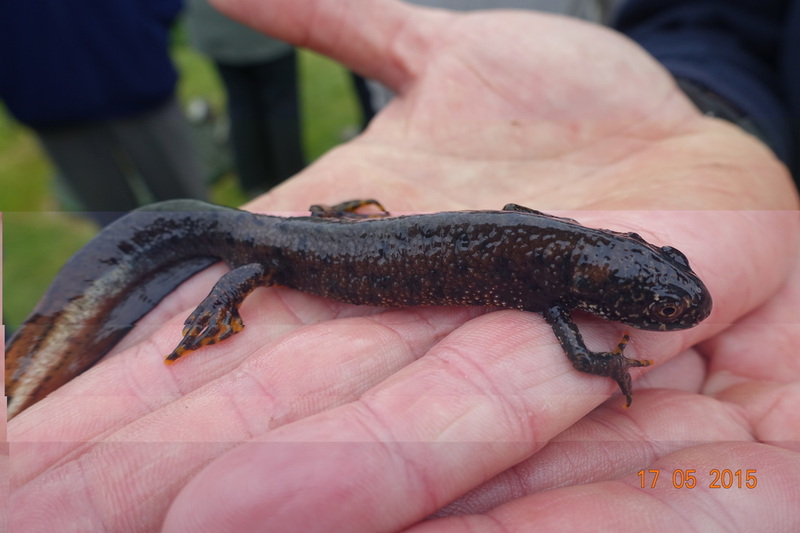 However the stars of the show were the newts: Smooth, Palmate and Great Crested, the latter named for its size and vivid black and yellow coloured sides. A fact that stuck in my mind was that the female Palmate Newt is distinguished from the male by two white spots on one back foot. Make of that what you will! The tea, provided by NATs members and our hospitable hostess, fulfilled its promise and the whole setting of the terraced garden with its magnificent panoramic views of the Bybrook Valley and hills beyond made it an outing to remember. Isn't it an amazing feeling when you can virtually touch a priceless historic object? Box NATS achieved this when they went to Salisbury in April to see the Cathedral's copy of the historic Magna Charta. Only four copies of the original charter of 1215 survive and Salisbury's has the king's seal still attached. It was a surprisingly small document, A3 size, closely written in manuscript. It was a most eventful day, travelling in style in a coach usually reserved for Swindon Town Football Club, far too spacious to make the road down to the Selwyn Hall car park. We enjoyed two marvellous tours: a guided tour of Salisbury Cathedral and an individual look around the National Trust's elegant eighteenth century property, Mompesson House in the Close. Both were fascinating. The tour of Salisbury Cathedral included details about the spire (Britain's tallest), the Cathedral clock (Britain's oldest) and Christopher Wren's internal flying buttresses (to stop the building collapsing). Fortunately the guide spared us a close inspection of the 332 steps to discover the ancient roof space. The most interesting part of the tour was the revelation of close connections between Salisbury and the village of Box. When the original Cathedral was moved from Old Sarum to the centre of Salisbury, the reconstruction was completed by archbishop Richard Poore. This was the same man who arranged for Box Church to be awarded to Monkton Farleigh Priory. The guide confirmed that this was a most unusual gift because the archbishop was so keen on fundraising for Salisbury. We also saw the curious tomb of St Osmund which had holes in the sides, which was apparently a replica of that which at one time was the resting place of Thomas à Becket. The holes were designed to allow people to touch the actual coffin of the saint, whose body rested in heaven thereby connecting heaven and earth. It really was remarkable to touch history (and heaven) on the NATS outing.